Midshipman John Aubrey Froude of the Royal Navy, HMS Cressy. Son of Ashley and Ethel Froude of Collapit Creek, Kingsbridge. Born in South Kensington in the June Quarter of 1898. Died 22 September 1914 aged 16. 155164 Chief Petty Officer Charles Bedford Distin of the Royal Navy, HMS Indefatigable. Boy entrant to the Navy. Son of William and Elizabeth Distin of Aveton Gifford and husband of Emma (née Perraton) of 5 Frogmore Terrace, Westville, Kingsbridge. Born in Aveton Gifford 8 June 1872. Died 31 May 1916 aged 43. K/16098 Leading Stoker Reginald George Harvey of the Royal Navy, HMS Indefatigable. Son of William and Alice Harvey of 17 Duncombe St., Kingsbridge. Born in Kingsbridge 22 March 1896. Died 31 May 1916 at the Battle of Jutland aged 20. 10607 Private James Henry Stone of the 8th Battalion, the Devonshire Regiment. Son of Frederick and Sarah Jane Stone of Southfield Cottages, West Alvington. Believed to have been born in Sherford in the June Quarter of 1898. Died 26 September 1915 aged 17. 51284 Gunner Edric Henry Chope of the Royal Garrison Artillery. Son of Frederick and Ann Chope of West Alvington. Born in West Alvington in the March Quarter of 1895. Died 31 March 1916 aged 21. 14117 Private Ernest James Moore of the 2nd Battalion, the Dorsetshire Regiment (formerly of the Devonshire Regiment). Son of Osmond and Rhoda Moore of West Alvington. Born in West Alvington in the December Quarter of 1884. Died of wounds in India 6 May 1916 aged 31. Private Albert Rowe, believed to be of the 8th Battalion, the Devonshire Regiment. He may have been a relative of Edwin and Elizabeth Rowe who came from Cornwall to farm in West Alvington in the late 1890s but was not included with them in the 1901 census. 14865 Private George Haynes of the 9th Battalion, the Devonshire Regiment. Son of John and Mary Haynes of West Alvington. Born in West Alvington in the September Quarter of 1884. Died 9 January 1917 aged 32. 38541 Private Albert John Jeffery ( also Jeffrey in some records) of the 1st/4th Battalion (T.F), the Devonshire Regiment. Son of Thomas and Jane Jeffery of West Alvington. Born in Kingsbridge in 1896. Died in Mesopotamia 3 February 1917 aged 21. Lieutenant William Horniman Balkwill of the 2nd Battalion, the Wiltshire Regiment. Son of Charles and Edith Balkwill of "Ashleigh", Kingsbridge. Born in Kingsbridge in the June Quarter of 1892. Died 9 April 1917 aged 24. Sergeant Herbert Harold Owen Matthews of the 42nd Battalion, the Canadian Infantry, Quebec Regiment. Son of Benjamin and Lucy Matthews. Born in Broad Oak, Essex in the March Quarter of 1896. Died 28 August 1918 aged 22. Awarded the Military Medal. 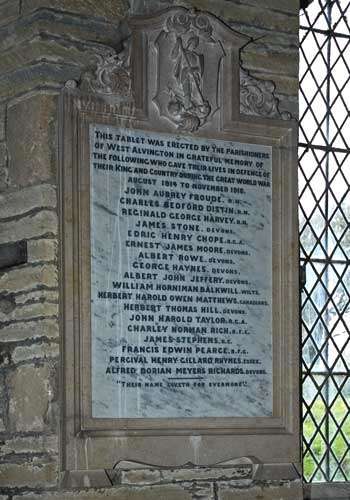 His connection with West Alvington is not yet known. 25946 Private Herbert Thomas Hill of the 1st Battalion, the Devonshire Regiment. Son of Thomas and Emily Hill; husband of Grace (née Barrows) of 2 Rosedale, Westville, Kingsbridge. Born in Tetbury, Gloucester, in the September Quarter of 1884. Died 4 October 1917 aged 33. 218579 Driver John Harold Taylor of "C" battery, 170th Brigade, the Royal Field Artillery (the memorial says Royal Garrison Artillery). Son of Samuel and Mary Taylor of Kingsbridge. Born in Kingsbridge in the March Quarter of 1892. Died 12 September 1918 aged 26. 235147 Private 1st Class Charley Norman Rich of the Royal Flying Corps. Son of Thomas and Ann Rich of Fore Street, Kingsbridge. Born in Kingsbridge in the September Quarter of 1889. Invalided home and died 9 October 1918 aged 29. Buried in the churchyard of St. Thomas-à- Beckett, Dodbrooke. 454383 Sapper James Stephens of the 1st/1st Lowland Field Company, the Royal Engineers. Husband of Elizabeth (née Edgecombe). Born in Wellington, Somerset in the September Quarter of 1878 but later came to work in the West Alvington area for the local council. Died 1 January 1917 aged 38. 23325 Air Mechanic 1st Class Francis Edwin Pearce of the Royal Flying Corps. Son of James and Elizabeth Pearce of Lower Street, West Alvington. Born in West Alvington in the June Quarter of 1885. Died in Baghdad 23 November 1918 aged 33. 43771 Private Percival Henry Gillard Rhymes of the 11th Battalion, the Essex Regiment. Son of Thomas and Bessie Rhymes of 6 Southfield Cottages, West Alvington. Born in South Milton in the December Quarter of 1887. Died 28 May 1918 aged 30. 140546 Private Alfred Dorian Meyers Richards of the 8th Battalion (Infantry), the Machine Gun Corps. Son of Alfred and Alice Richards. Born in Lymington, Hants, in the June Quarter of 1897. Died 4 October 1918 aged 21. Enlisted in Kingsbridge from West Alvington.